Our friends over at MakingStarWars.net picked up on a tweet today from the FlyMAC, England's most popular flying school. The tweet reads "Last tweet for the night. I spotted this at the weekend whilst #flying over Greenham Common. 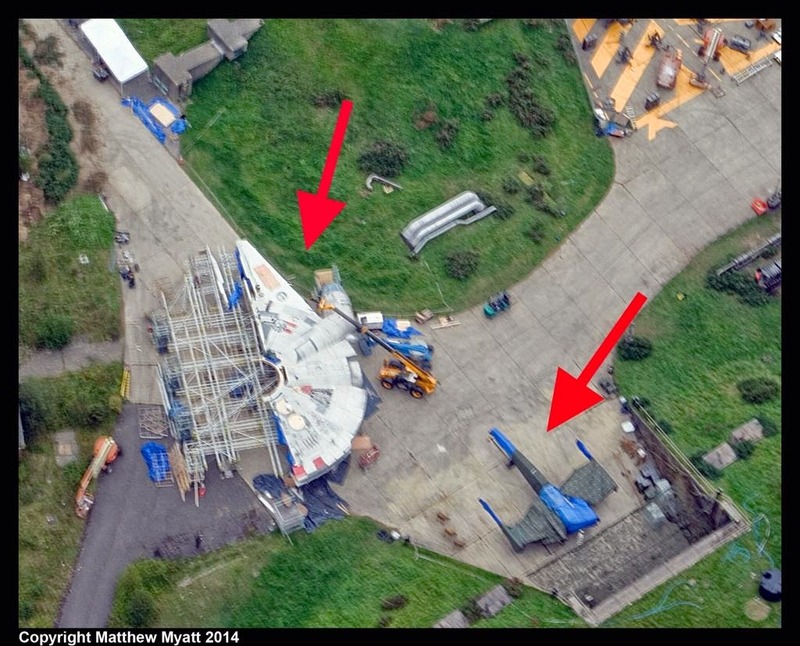 #StarWarsEpisodeVII" and features a picture taken from the sky of a half built Millenium Falcon and an X-Wing covered by several tarps. I think it's safe to assume that Star Wars Episode VII is filming some exterior scenes at Greenham Common. It looks like they are in the process of setting up for a scene. If you look closely you can see a crane right next to the Falcon, there also appears to be a "skeleton" for the rest of the ship. I must say, it's a nice change of pace to see the exterior of the Falcon, as well as the X-Wing, on location. I personally have grown tired of leaked pics of the interior of the Falcon because (1) we already know what it looks like, and (2) we already know it's in the film. So seeing this new photo gives us the opportunity to wonder and speculate about where in the galaxy that might be and what's going on.